Glencoe is possible the best climbing venue in Scotland. It is certainly world class. Steeped in history and tradition with scenery as beautiful as you'll find anywhere the world over, Glencoe is a truly magnificent place. Check out the Glencoe Website for more about the glen's history and local information. The guidebook for this area is the SMC Guide for Glencoe and Glen Etive. As you can imagine, if it has a whole guidebook for itself, this page is hardly going to scratch the surface. This page is also likely to grow several times a year, after every visit. Even with a lifetime of visiting the glen, though I couldn't start to be comprehensive. Please email me anything you'd like to share with us! Firstly you'll cross Rannoch moor which is beautiful, you can see over to the Mamore range from here. Watch out for deer on the road though. 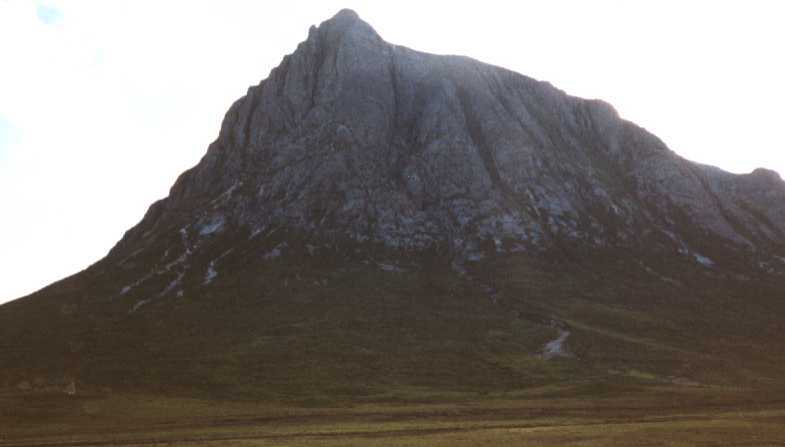 Following the road, you'll see Buchaille Evite Mor (Boockle Etive More) looming up, apparently guarding [shepherding] the glen. From a distance this is an archetypal, triangular mountain. It's even more impressive close up! There are literally hundreds of climbs on this mountain, many of which are absolute classics. It would be easy to spend a whole week here and not climb half of what you want to... (and that's nothing to do with the weather or midges). The massive mountain at the back of everything else. The beautiful conical peak in the middle. Firstly you'll see Am Bodach which leads across to the Aonach Eagach ridge. You'd be mad (or extremely dedicated) to come here just to go bouldering! At the moment we've not got much information down on paper about routes here. We'll develop it when we have time. The format is most likely to be one page per crag using this as the parent page. In the meantime.. If anyone would like to share their experiences , please do! Glencoe's on the left... you'll see the 'pap' from the bridge. A comprehensive guide to Winter Mountaineering in and around this area and the rest of Scotland. Including: local accomodation, amenities, and lots of other useful information on snow conditions and Mountain Guides. Glencoe is owned and managed by The National trust for Scotland. The Trust allows walkers and climbers full access to the mountains and maintains/protects the paths, plant and animal life in the area. Some of the paths are wonderful, if they make your life easier it might be nice to make a donation to the NTS who are a registered charity. The organisation cares for huge areas of land most of which are used by walkers, climbers and mountaineers! The main rule (apart from normal good manners) that the Trust ask is that you don't camp in the Glen. There are three official campsites and two pubs... No-one will mind if you camp high on the mountain but the police may ask you to move if you're at the roadside! Camping is permited in Glen Etive, which is extremely handy if your climbing on Buchaillie Etive Mor. Glencoe Mountain Rescue Team save hundreds of climbers every year. 1999 was incredibly busy with record numbers heading for the hills and record numbers of accidents. Because of their hard work and dedication team attended a record number of rescues. PLEASE MAKE A DONATION - the team cannot survive without your help! Remember, NEXT TIME, IT COULD BE YOU. There is plenty of parking in the glen. However, there have been instances of cars being broken into when parked on their own in the smaller laybys. Be warned. You can always find somewhere to park in Glen Etive, just make sure you get the car as far off the road as possible! If you're climbing on the north side of the mountain there is parking at MapRef 221 563 and at MapRef 213 560 (much better). There are plenty laybys in the glen, the best is the viewpoint at MapRef 171 568. This is also where the Mountain Rescue Team maintain the helipad. One of the best things about Glencoe which isn't listed above is the Clacghaig Inn. If you're staying in Glencoe you probably already know about it already and will definitely be visiting; if you're passing DON'T - stop for a couple of hour (or overnight) and sample some of the teriffic atmosphere (and Ales) available here. There is usually live entertainment (and its usually always good! ), you can dry your wet clothes by the open fire and play a couple of frames of pool, if you so desire. It is most unfortunate that they have chosen to stop serving Toasties, though! Very unfortunate. At the other end of the glen (Buchaillie Etive Mor) you'll find the King's House Hotel. I have never been there, but I believe they have a cheap(ish) bunk house and it also seems to be a popular stop-over for visiting climbers. is available in Glencoe Village. This is a couple of miles along the road, past the visitors centre (or the Clachaig)... keep heading for the North/Fort William and you'll get there. Ballahulish is also worth stopping in. There's an outdoor shop here if you need any gear.